Looking for an Independent Home Appraisal in the Houston Uptown Area? Our Texas certified appraisers are the premiere providers of independent residential and commercial real estate appraisals in the Uptown area. Our goal is to deliver a fast, accurate and comprehensive valuation report that serves our clients’ expectations exactly. We have some of the lowest appraisal costs in the area and take pride in delivering reports faster than the average appraisers. We only staff appraisers that are local to the Houston area and are experienced with its various markets. Our staff is capable of taking on jobs for residential, commercial or mixed-use properties. If you have a commercial property jobs, the majority of our Texas Certified General appraisers hold the MAI designation from the Appraisal Institute and are available across a sizeable portion of South-East Texas. Whether you need a property appraisal report for lending, private use or a legal issues, our appraisal services will work for most real estate valuation requirements. Whether you’re a homeowner or an industry professionals, we take pride in providing a friendly and reliable service. Should you have questions, or do not see the exact service you need, you can use our website contact form or call us directly at the number listed on this page. Getting in touch is fast! 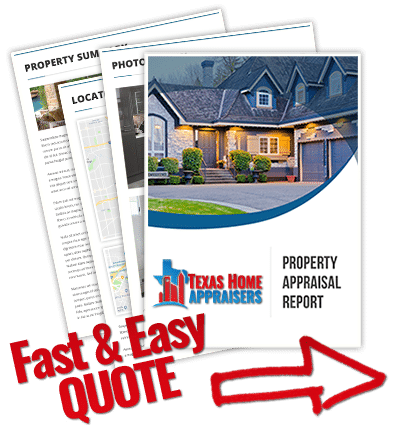 Just fill out the short quote request form or ring our direct line and one of our independent appraiser in Houston TX will be more than willing to talk about your appraisal needs. A home is typically the largest asset anyone will own and having it valued properly is a very serious matter. It is the job of the professional appraiser to determine these values by gathering, analyzing, and applying information pertinent to a property. The appraiser’s professional opinion acts as a hedge against risky investments or purchases within current market trends. Due to the risk involved for borrowers and lenders, the appraiser’s opinion of value reduces the possibility of overpaying or over lending on the purchase of real property. Just how much any particular individual improvement might add to your home’s market value, what appraisers typically call the contributory value, can often vary widely from market to market, dictated by the wants and needs of each neighborhood. It’s best to reach out to a local real estate appraiser if you have questions about upgrades that would suit your neighborhood and lend the most effective improvement in value. A tax assessor researches recently sold homes to determine the appraised value, they do not rely on the most recent appraisal. Due to local tax authorities being a government entity that can directly affect the appraisal process, appraisers must comply to any questions local tax authority may have. The only time an appraisal value would indirectly affect taxes would be in the case of a purchase and that would only be if you purchased for the price of the appraisal.